All-in-all, the Dallas Cowboys had a rather good 2018 season. They made it to the Divisional Round but lost 30-22 to the Los Angeles Rams, having been cut apart by C.J. Anderson and the next-level superstar Todd Gurley, who ran riot thanks to an impressive showing from their offensive line. The Los Angeles Rams were one of the early favorites to win the Super Bowl and dominated for much of the regular season, so for the Cowboys, who were once considered dark horses to even make the playoffs, losing to them shouldn’t be too disheartening to the team. Now, the Cowboys get to use this season’s impressive showing to build toward an even better 2019 campaign, in which Dallas could move beyond the Divisional Round. So, here’s the best that the Cowboys can hope for in this offseason. It’s somewhat of a strange concept across the sporting world to back the team that defeated your team, but in the NFL – and many other major league sports – there is an understanding that losing to the eventual champions is a fair consolation prize for your season ending early. It doesn’t help the team very much, but the loss is considered to be almost unavoidable as the eventual champions were destined to be just that. So, for the Dallas Cowboys to take some solace from the postseason, they need the Los Angeles Rams to defy the odds and win the Super Bowl. But, with the NFL betting seeing the Saints as favorites at +180, the Chiefs just behind at +260, and then the Pats and Rams at +350, it seems like the Cowboys’ loss won’t be a stepping stone for the eventual champion. During the regular season, the Dallas Cowboys decided to make the most of the Oakland Raiders’ fire sale by bringing in Amari Cooper, which had an immediate impact. Cooper proved to be an explosive option on many occasions, helping to keep defenses honest to give Ezekiel Elliott more room to operate. Over the course of the season, Michael Gallup also developed well, proving that one day soon, possibly next season, he could work as a very valuable secondary receiver. 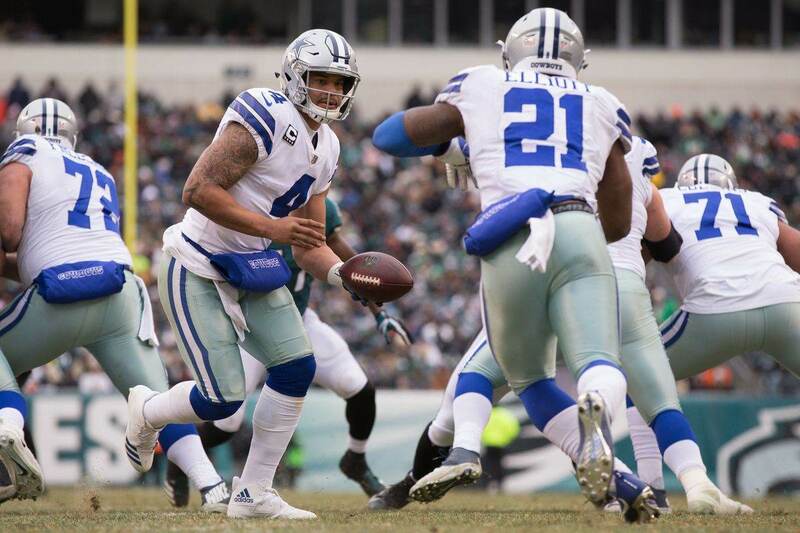 With these two in Dak Prescott’s arsenal for next season, the Cowboys would do well to add one or two more options as this is a passing league, and the Cowboys lacked that element to their offense for much of the 2018 season. According to Spotrac, the Cowboys are set to shed $4.25 million and $1.875 million from their wide receivers bill with Cole Beasley and Tavon Austin expected to hit the free agency market. A further $4.1 million could also be freed up if the team rids themselves of Terrance Williams after his season of turmoil. So, without considering moves elsewhere on the team, Dallas is poised to have some money to play with in the summer. One way that they could enhance the offense is with a tight end who can also function as a strong receiving option. Throughout the season, Pittsburgh’s Jesse James worked his way into being one of the best tight ends with an expiring contract. At 6’7’’, 24 years old and having reeled in 423 yards and two touchdowns, an enhanced role for the Cowboys could evolve this offense a great deal. Another option is UFA Tyler Eifert of the Cincinnati Bengals. But, he would be a huge risk given his three-year injury crisis. From 2016 to 2018, Eifert has only played 14 games, but, when he has played in that time frame, he’s scored six touchdowns and collected 619 yards. In his 13-game season of 2015, he landed 13 touchdowns and 615 yards. For the Dallas Cowboys to take the next step, improving their passing game must be their primary focus in the offseason – but not at the expense of other well-performing areas.